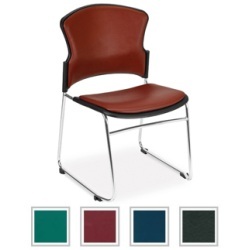 Stacking Chairs - OFM 310-VAM Anti-Microbial Vinyl Seat Stack Chair. Price includes shipping for this stack chair when shipping to the lower 48 United States. Get a great looking stack chair for you office, school, church, or assembly area with the 310-VAM office stack chair. This office chair features an anti-microbial, vinyl seat and a chrome-plated steel frame for extra support. Connect multiple chairs together using the built-in ganging brackets. Each chair has a weight capacity of 250 lbs. Order your OFM stacking chairs here. Durable plastic shell seat and back. Vinyl seat and back cushion. Anti-bacterial, anti-microbial vinyl making these a great option for public areas. Chrome plated steel frame adds a stylish finish to each chair. Built-in ganging brackets for attaching multiple chairs to each other. Available for quick ship. This means orders generally leave the warehouse in 1 to 3 business days and take about 3-5 business days in transit, depending on proximity to the warehouse. Seat size: 18.5 inches W x 17.5 inches D.
Back size: 17 inches W x 14.5 inches H.
These stack chairs are available in 4 different colors: 602-Teal, 603-Wine, 605-Navy, and 606-Black. Choose your color options in the top right corner of this listing. The 310-Dolly is a compatible chair cart and can stack about 16 chairs high. Fast Shipping: Orders for the OFM 310-VAM generally leave the warehouse within 1-2 business days. Dimensions: 31" x 27" x 22"